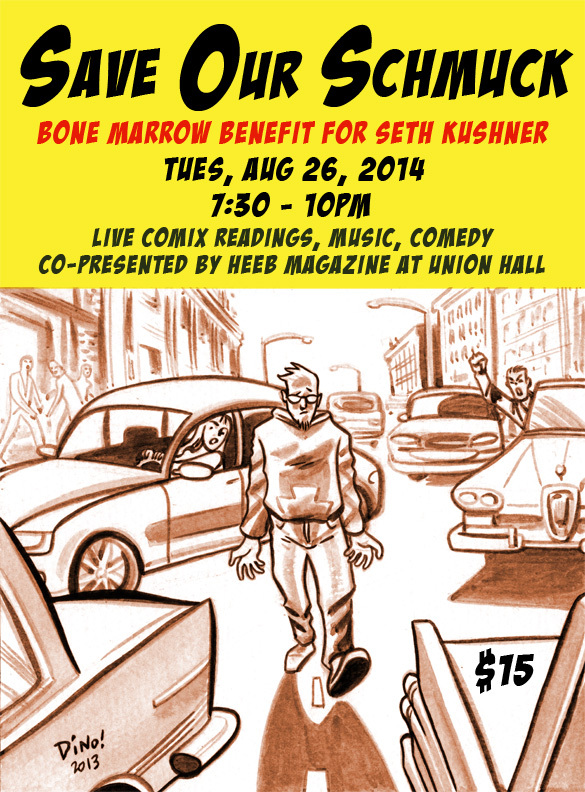 An evening of live comix readings, music, & comedy raising funds for health care costs related to Seth Kushner’s fight with leukemia. Seth is a lifelong resident of Brooklyn, NY, where he and his wife, Terra are raising their five year old son. A renowned photographer, his work has appeared in The New York Times, Time Magazine, Newsweek, L’Uomo Vogue, Sports Illustrated, The New Yorker and other publications. Published books include, The Brooklynites, Leaping Tall Buildings: The Origins of American Comics and upcoming New York Comics. Seth is co-founder of TRIP CITY, home to his CulturePOP photocomix and Schmuck comics. In 2013, Seth co-founded HANG DAI Editions an independent publishing imprint. Help Seth and others find their match by registering at this event to become a bone marrow donor with Delete Blood Cancer — All it takes is completing a registration form and swabbing the inside of your cheeks. In less than five minutes, you can potentially save a life! SAVE OUR SCHMUCK Benefit photo album, organized by Jeff Newelt. Photos by Kathleen Ching.